Thermal Targeting ™: This on-board microprocessor based algorithm monitors thermostat activity and continually evaluates how much heat the house requires. When it is very cold outside, the demand for heat is high and the Fuel Smart HydroStat raises the boiler’s Target Temperature to provide needed heat to the house. When the outside temperature is milder, the demand for heat is lower. During these periods, the Fuel Smart HydroStat lowers the boiler’s Target Temperature- saving fuel- while continuing to provide comfort to the house. Outdoor Reset & Warm Weather Shutdown: For those who prefer the more traditional outdoor reset approach, Hydrolevel offers a low cost OS-100 Outdoor Sensor Kit (sold separately). When the sensor is plugged into the control, the boiler reset methodology changes instantly from Thermal Targeting to Outdoor Reset, where the boiler temperature is governed by the temperature outside. The addition of the sensor also allows the control’s Warm Weather Shutdown feature to be activated. This feature prevents the boiler from supplying space heating when the outside temperature exceeds a selected level. Thermal Pre-Purge: Further enhances boiler efficiency by supplying latent heat, that may remain in the boiler from a previous run cycle, to the heating zone requiring heat. The control activates the burner only when it determines that the latent heat will not be adequate to satisfy the heating demand. During the Pre-Purge cycle, the display will indicate Pur. Degrees Celsius: Changes the control’s settings to display Celsius. Manual Reset LWCO: Changes the low water cut-off function to manual reset, which is required for many commercial installations. Circulator Activation: Can be set to activate the primary circulator on calls from t/t, ZC/ZR, or both. Enhanced Condensing Protection: To reduce the potential for condensing, on a call for heat, this feature allows the boiler to heat to 125°F prior to energizing the circulator. Once activated, the control continues to monitor boiler temperature and interrupts the circulator if it drops below 115°F. 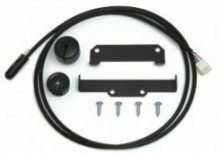 Kit includes: 2 mounting brackets, remote sensor, plastic grommet, rubber well cap, 4 #8×1/2″ self-tapping screws. 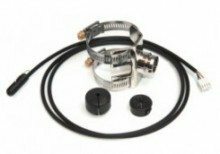 Kit includes: mounting bracket for 1″ to 2″ pipe, remote sensor, plastic grommet, rubber well cap.